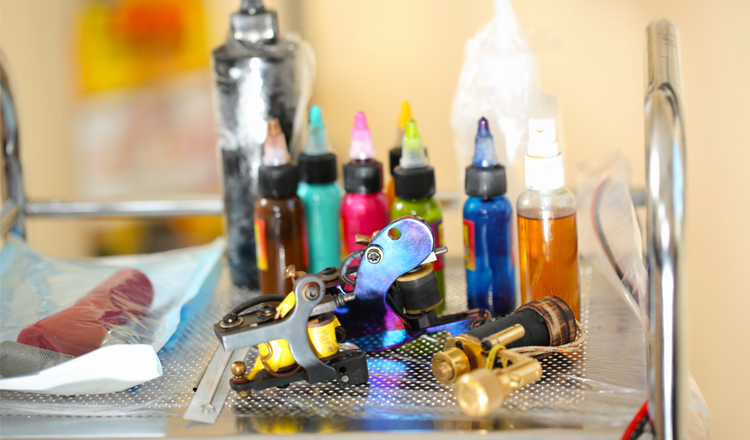 Direct365 understand that specialist waste from tattooists requires both suitable handling and disposal to ensure that you stay compliant with all relevant legislation. We offer a complete range of waste disposal products and services to help you segregate your waste and reduce the risk to you and your customers. Get a free quote to handle all of your waste needs, from sharps disposal to recycling, and we'll get back to you today. Used tattoo and piercing needles can be very dangerous for anyone who comes in to contact with them, which is why they must be disposed of safely according to the law. We’re here to help you stay safe and compliant with our reliable sharps bin and disposal services, providing you with a legally compliant, fully labelled bin and a flexible collection service that’s convenient for you. Whether you need regular collections or a one-off service, we’ll provide you with the same expert service, including all of the duty of care paperwork and a free waste audit when you sign up. We’ll even help you get registered with the environment agency to show that you’re a responsible and fully compliant tattooist, and not just a scratcher. Get a free quote today to handle all of your needle waste. Dealing with waste disposal on your own can be a time consuming and expensive chore, especially for a tattoo studio. Our general waste collection service is designed to help free up your time and save you money, so you can concentrate on tattooing your customers instead of handling rubbish. We’re here to help you with a wide range of bin sizes to cater for your needs, all with flexible servicing when you need them. Our range of bins includes sizes from 240L wheelie bins all the way up to 1100L lockable units, and we charge by the bin instead of by the bag to give you a better value service. With online account management, invoice history and payment options, managing your service is hassle-free, and our experts are always on hand to answer any questions you have about your service. Get a free quote for our expert general waste disposal service today. Your tattoo needles aren’t the only dangerous or infectious type of waste that you will have to dispose of in your studio. If waste like this isn’t disposed of properly it could lead to health and hygiene problems for your staff or your customers, including skin infections and bacterial diseases, as well as seriously damaging the reputation of your business. The best way to stay compliant with regulations is using a specialised clinical waste bin with a professional collection and disposal service. We’re here to help support your studio with our quick and easy to manage clinical waste service. We provide you with the bins and a flexible collection schedule to suit your studio, all you have to do is throw away your rubbish and we’ll take care of the rest. Our tattoo waste service is one of the most popular and affordable in the UK, with 25% of UK tattooists choosing our service and more joining them every day. Get a free quote today and you’ll never worry about clinical waste again. We provide a full range of waste collection services for your specialist waste needs; from needles and swabs, couch roll and gloves. We can help you to identify the type and frequency of sharps waste that is to be disposed of and we can tailor a package to suit your individual requirements. Our staff are fully trained and can offer expert advice to make sure you and your business are compliant with the most recent legislation, something we know can be tricky to keep up to date with. Get in touch with us to find out more about our clinical waste disposal services.